Beautiful 17th century English Jacobean armchair. Carved floral motifs and inset tapestry back. Date is carved into the back head rest, 1685. Beautiful 17th century English Jacobean armchair. 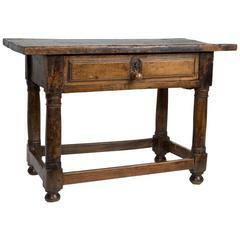 Carved floral motifs and inset tapestry back. Date is carved into the back head rest. 1685. 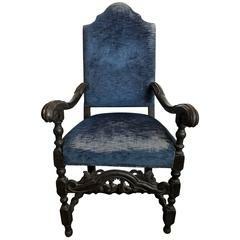 Antique walnut armchair with swam motif arm details. The chair has been recently professionally reupholstered in naturally died Italian calf leather and nailheads. 19th century English writing slope. 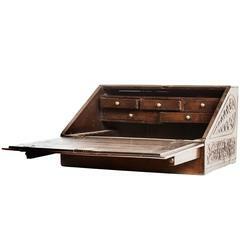 Walnut with carved sides, five interior drawers and brass lock and pulls. A 17th century Continental walnut armchair with turned legs and stretchers upholstered in brown leather. Possibly Spanish. This chair has wonderful distressed patina of the leather and the wood perfect for a Tuscan, French or Spanish style home. 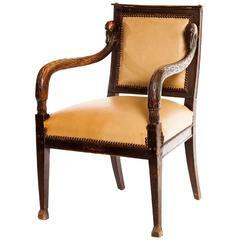 17th century French walnut armchair. 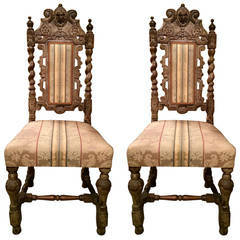 A very handsome pair of 17th century William and Mary side or hall chairs with exquisite carving throughout. Oak with a faded grey that gives these chairs a warm patina. Period Dutch walnut armchair of the late 17th century --Beautifully turned stretchers. Arched back. Scrolled arms. 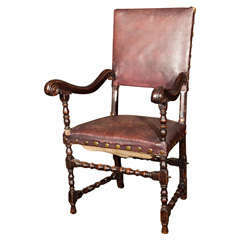 Great patina, Large size --Now in fitting suede leather. Magnificent pair of 17th century armchairs with a needle point seat cover.